Bobby Flay could be called the burger whisperer. His burgers are delicious, juicy and amped up with amazingly creative and delicious over-the-top toppings. Here, six killer recipes he shared with Food & Wine. Bobby Flay could be called the burger whisperer. (So could F&W’s Justin Chapple who came up with this genius way to form perfect patties.) His burgers are delicious, juicy and amped up with amazingly creative and delicious over-the-top toppings. Here, six killer recipes he shared with Food & Wine. The name says it all: These burgers are topped with gooey cheese, salsa chiles and crunchy tortilla chips. 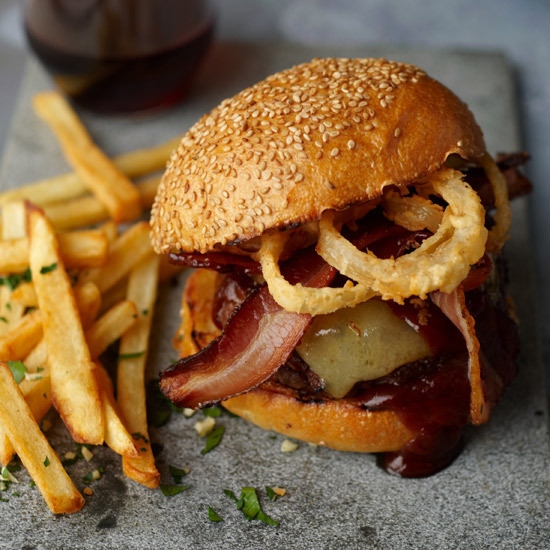 These hearty burgers are perfect for brisket lovers. The homemade BBQ sauce for these burgers is smoky-sweet. It’s made with two forms of chile—ancho chile powder and chipotle in adobo sauce—and peanut butter for sweetness. Instead of serving onion rings on the side of a burger, put them directly on the patty. You won’t regret it. The key to these fantastic turkey burgers: a sweet-spicy sauce of mustard, horseradish and honey. Instead of frying bacon, Flay brushes them with mango chutney, then bakes them in the oven; the sweet, crispy, smoky pieces are irresistible. Related: Best Bacon Burgers in the U.S.